National Park Trust Advisory Board member and longtime teacher, Carolyn Cohen has had a large impact on our Buddy Bison School Program over the eight years she has worked with us. This month, she shares the story of how her Kids to Parks Day lesson left a lasting impression on her students. “For eight years as an elementary school teacher, I championed National Park Trust’s mission to make our local and national parks accessible to children of all economic backgrounds. I witnessed the joy of children playfully engaged with nature, incorporating life skills such as problem solving, cooperation, and stewardship, while reaping the health benefits inherent in outdoor play. 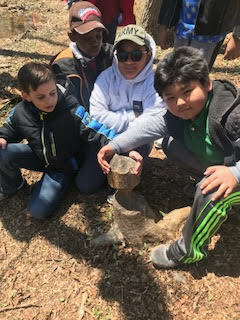 Washington Grove students pose with a beaver-felled stump during their park trip. Through National Park Trust I learned that many children did not have the opportunity to take advantage of our local, state, and national parks. Not all schools could afford the transportation costs for a park visit, and many families did not have the means or the transportation options to visit these parks on their own. To help address this inequality I decided to have my third grade class enter the Kids to Parks Day School Contest on behalf of a nearby Title I public school. They would calculate the budget and create a compelling story for their narrative to explain why this Title I school should receive a free park trip in their stead from National Park Trust. The process of completing the application was an extremely gratifying endeavor for the students, it worked perfectly with my curriculum and provided an experiential learning component for them that was relevant and tangible. The students researched costs of snacks for the trip and used the food ads in newspapers to find the best bargains for healthy snacks. Budgeting for this gave them experience combining math skills and economically derived decision making. My students worked together and decided that using a persuasive writing style would be more interesting and help them win the contest. They researched local parks, collecting photos of their favorites and adding captions to captivate their audience. They learned how to choose a park within reasonable proximity to the selected school and planned a boat trip on a lake for the lucky winners. Some of the children even called the selected park to determine any additional costs for this experience. The students exhibited great joy as they worked hard to provide this trip to other kids who would not otherwise be able to enjoy such a field trip. Their final application was an entire book, bound to accompany their application—a beautiful blend of technology and written expression showing why another class deserved this trip. When my class learned that they were one of the national winners, the cheers were deafening, there were high-fives all around and smiles that could not have been bigger. They were so proud that their hard work had paid off and that kids just like them that couldn’t have visited a park otherwise were going to experience the fun and adventure of a trip outside. The best moment came for my students at the end of the year, when they received handmade thank you cards from the fifty students from the winning school, expressing their gratitude for the free park trip. Because of my students, fifty children went on a free class trip that seamlessly integrated with their science curriculum and let them witness first hand the habitats and ecosystems they were studying in class. They took a boat ride—many for the first time in their lives—with a naturalist who showed them the species they had studied in class. Their day was filled with healthy outdoor exercise and allowed them to engage with nature and experience the wonder of the outdoors.